"When you stand and share your story in an empowering way, your story will heal someone else." Karma yoga can be summed up as acts of selflessness, benefitting others whilst moving your own ego out of the way. It's a form of action based yoga and one of the 4 main paths of yoga. Raja Yoga, the physical practice of yoga asanas being the one we tend to be more familiar with. In my aim to cultivate a good personal sense of giving back, I'm sharing here some of my karma yoga actions with the aim of reminding myself how good it feels to support others and perhaps inspire you and others to share some karma yoga on your journeys. 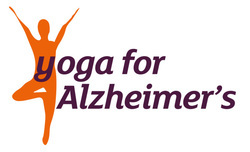 Raised £90 for Carers Centre through our Sun Salutations - thank you everyone that supported and contributed! 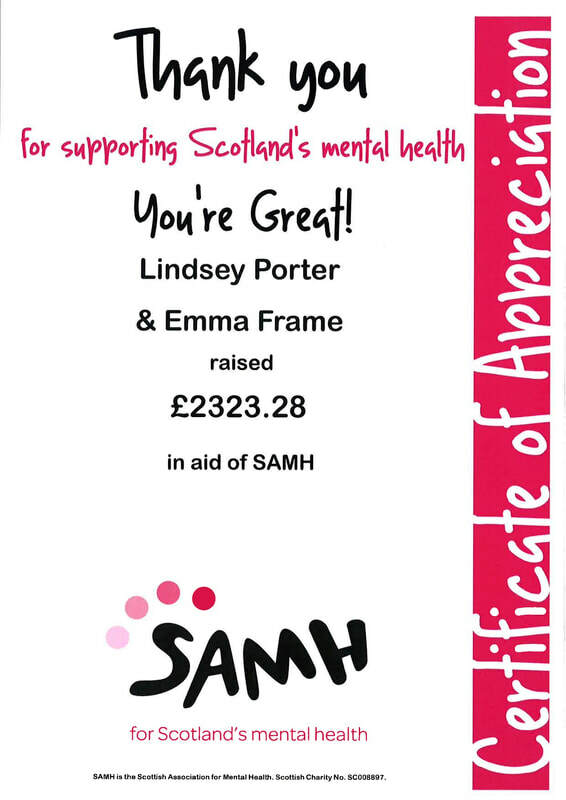 From our 2018 Charity Scottish Yoga Calendars our end result was raising and donation to the SAMH charity over £2,500! Yay! June 2017 - We raised £50 for this charity through taking part in doing 108 yoga Sun Salutations (Surya Namaskar) on the summer solstice. Sept 2017 - At the Secret Herb Garden Yoga Festival Event selling our 2018 Yoga Charity Calendars. Feb 2017 - Honoured to be part of the Pay-it-forward Edinburgh yoga festival 2017sharing a Curvy Yoga practice and insights. 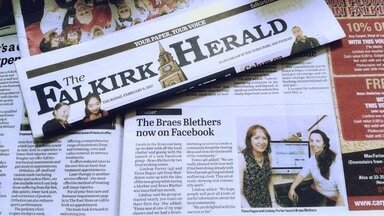 Overall raised £5,636.49 which will be used for community outreach projects involving yoga in/around Edinburgh. 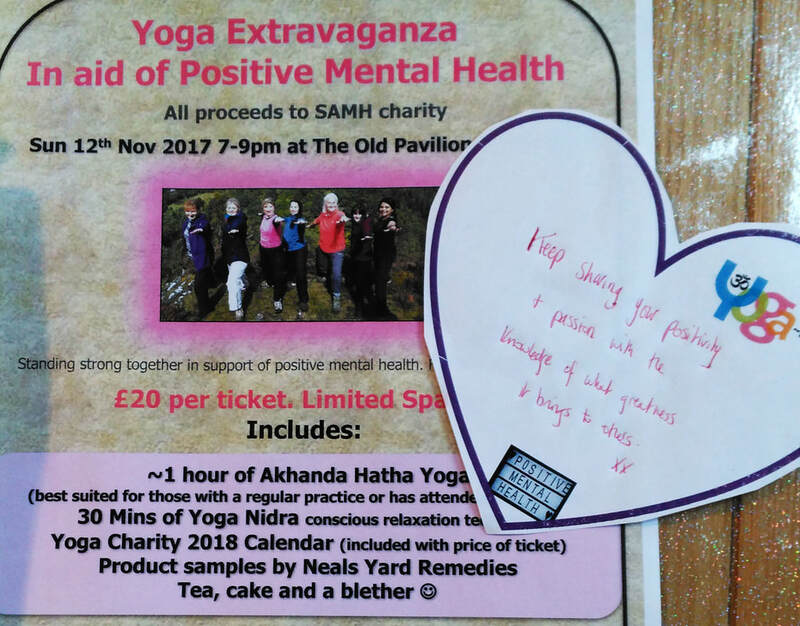 Dec 2016 - Raised £46 funds for SHA (Scottish Huntingtons Assocation charity) by raffling off a place on my SOLD OUT Jan 2017 1 Day Urban Yoga Retreat. Thank you all. 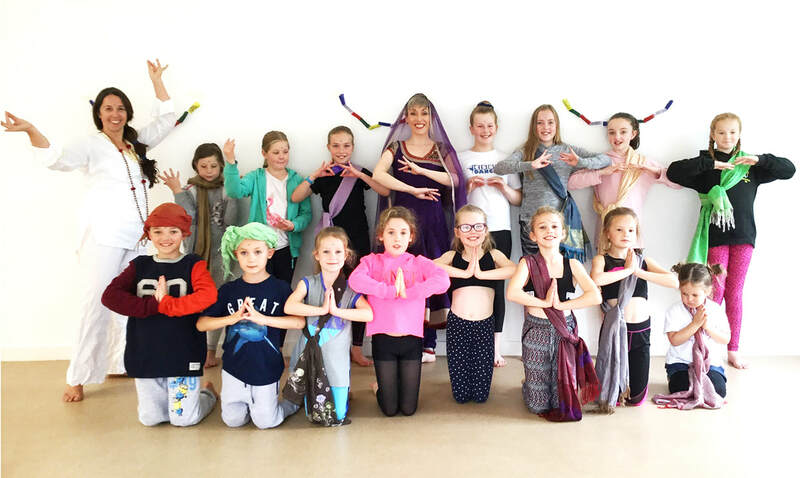 April 2016 - Thanks to all that came along we raised £60 doing a yoga session by donation, going towards Scottish Huntingtons & supporting Marie who is HD positive & trekking the Himalayas to raise funds & awareness in Nov 2016. Just Giving page click here. Jan 2016 Held a charity yoga session as part of the Mighty Swimmers charity pool party at Linlithgow Academy. All monies to Aspire charity to help raise funds for Kalie (Director of Mighty Swimmers) channel swim in 2017. Nov 2016 - had fun sharing yoga with 26 Beavers aged 6-8! June 2016 - volunteered my time to be one of 4 yoga teachers running an amazing 2 hour yoga session in Glasgow. Proceeds went to Alzheimer's Research UK. 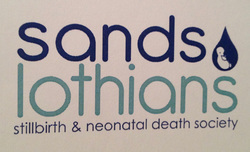 Feb 2016 - gave an afternoon of my time to give Indian Head & Reiki treatments to bereaved parents and helping raise funds for this small Edinburgh based charity. 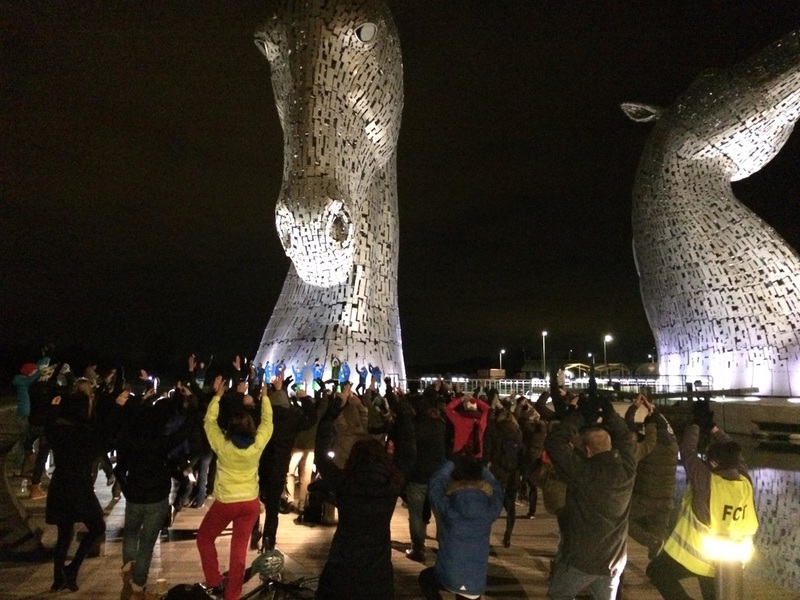 March 2016 - Gladly took part in Falkirks' Earth Hour Celebrations to lead a Yoga Pose Guiness World Record attempt in front of the iconic Kelpies statues, Falkirk. As you can we had a great turn out and anticipated new world record!! Supporting the great work Smart Work Edinburgh does since May 2015 to give women the tools and confidence to return to work as well as ensure their volunteers have a great experience. Click here to find out more.